Within days of its release, Pokemon GO has become insanely popular. Hitting the top of the iOS app charts in under a day, outselling Candy Crush and Clash of Clans in just a tad longer… it’s already on target to be one of the biggest things for the franchise since the days of Red and Blue on the original Game Boy. But I digress. Basically, a fake Pokemon GO app is on the Google Play Story, and people have reported using it gives them malware. It’s not non functional (it is actually a working version of the game), just dangerous because some scumbag has hidden a virus in the app and it causes problems with your phone as a result. It’s a valid concern though. Distracted driving is dangerous, so don’t play video games while driving a vehicle. So yeah, don’t drive and play Pokemon kids! Otherwise you could be like the people in this story.. Which had various unfortunate accidents due to being too distracted by the game. Like Mike Schultz from Long Island New York, who fell off his skateboard while looking at the Pokemon GO app. Or Kyrie Tompkins who fell and twisted her ankle while playing the game in Waterville, Maine. But less about the accidents for now, how about something a tad more light hearted? There are all kinds of amusing examples here. You’ve got the guy who encountered a Gastly while using the app before a major operation in hospital. That’s got to be a bad omen! Either way, you can see lots of funny examples in this Shacknews article, or just on the Pokemon GO subreddit in general. But honestly? The chance this would actually happen is rather slim. Pokemon GO is a simple mobile app, which pretty much doesn’t look suspicious regards of who’s using it and where. The situation with law enforcement and discrimination is terrible in much of the US, but this might be pushing it as far as credible arguments go. This strange little bit of news. A user on Imgur actually found a lost cow while looking for Pokemon in the game, and called the local authorities about it afterwards. Either way, if you’re a farmer… well, guess Pokemon GO could act as a nice unintentional way to get the public to round up your missing cattle! 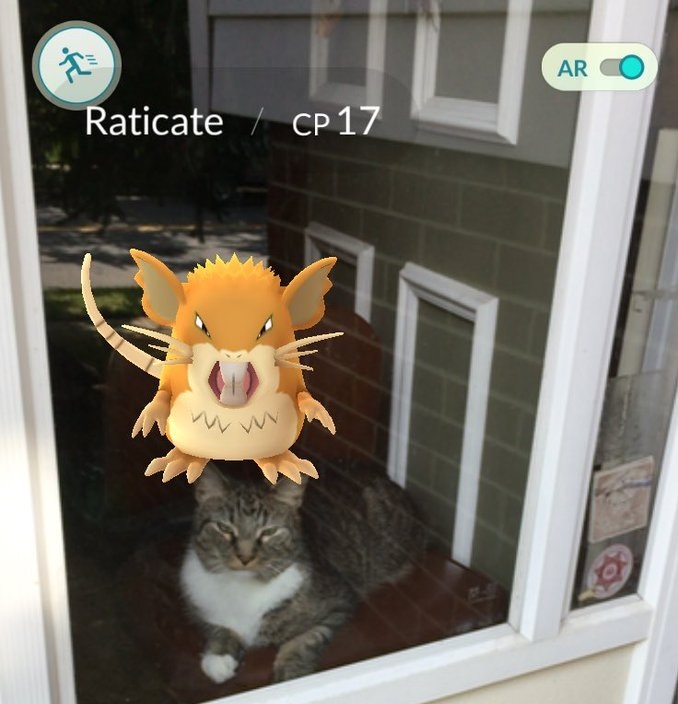 A recently released and very popular new mobile game called Pokémon Go encourages players to use their smartphones’ GPS and back-facing cameras to catch virtual Pokémon in real world locations. This game encourages kids (and adults) to roam in public places and locations in search of Pokémon characters. It has been reported that some Pokémon characters are showing up in NCH secured areas and gamers are trying to get to the characters. You do have to wonder how necessary these warnings are (I mean, even if distracted, I doubt many people will stroll right into a restricted area in a hospital), but it’s amusing to watch none the less. Where some Pokemon GO players met late at night looking for Onix, and their actions got mistaken for a drug deal in progress by a police officer. So I wander over by the truck and sure enough there’s a f—–g Onyx there. Awesome. So I end up chatting with the guys for a bit, told ‘em where I got my Evee, they convinced me to join red team when I hit level five so we could ‘lock s–t down” in the neighbourhood. Then the cop shows up. Yeah, so it turns out two twenty-something black dudes and a 40-year-old white guy chilling in the park at 3am looks strange. It took a bit of talking to convince the cop we weren’t doing a drug deal, and a bit longer to explain the game. Then the cop downloaded the f—–g game on his phone and asked us how to get started. Guess 3 people chilling in the park at 3am looks a tad strange to some people. Still, at least they introduced the cop to Pokemon GO! It’s sad to see, but it makes sense. Criminals always look for new means in which to find people to target, and an app like this can work to that means. Namely, the one where a 19 year old girl found a dead body while looking for Pokemon in Riverton, Wyoming. That’s a pretty disturbing discovery for someone looking for a few Pokemon with an app, isn’t it? Still, at least the Fremont County Sheriff’s Office says the death appears to be accidental rather than related to an actual crime of some sort. So that’s the list. We’ve got a few paranoid rantings, crimes in progress and all kinds of strange pictures too. Quite the selection eh? And what’s more, they’ve all occurred in the last few days or so! So not only do we have ten of the strangest Pokemon GO stories in history, but they’ve also all happened before the game’s even been released outside of Japan, North America and Australia! Kind of makes me wonder what’s going to happen when Europe or South America gets the game for the first time… Or when Pokemon GO becomes a big deal over in the Middle East! What strange stories will that bring? There is a latest story going around a guy just ended his career by using the app in a restricted area in his company where taking images is illegal.